Tue., Dec. 20, 2016, 11 a.m.
Christmastime tamales take many hands. Hands to mix the masa. To tenderly fill and fold the husks. To eat the steamed corn dumplings as soon as they’ve cooled enough to touch. Those hands – of mothers and daughters, fathers and sons, aunts, cousins, far-flung and close-knit relatives – continue a tradition that was carried across a border and into casas throughout a new country. The ritual – more often than the exact recipe – is passed down through the generations. Tamales bring people home for the holidays and warm and fill their bellies. They tie families to their homelands or the countries of their parents or grandparents or forebears that go back even further. Tamales reach back to ancient Mexico and Central America. And for many Latino families today, they’re a Christmastime specialty – whether that means making them themselves by hand with help from the whole family or picking up a couple of dozen at De Leon Foods Deli and Grocery Store. Today, the 42-year-old president of De Leon Foods – which she runs with her husband, Sergio, 47 – doesn’t have time to make tamales at home. She gets hers at their grocery store on East Francis Avenue, where her sister is the kitchen manager and main maker of tamales. “They remind me of my family, where I used to be when I was little, where I lived in Mexico,” she said. In ancient Mexico and Central America, corn was the staff of life. In those early times – maybe as early as 8000 to 5000 B.C. – tamales were stuffed with just about any ingredient available: fish, frog, mushrooms, rabbit, gopher, eggs, squash blossom, honey, ox, turkey, seeds, nuts. Today, peppers, pork, chicken, cheese, cactus, beef, vegetables, strawberries, coconut, prunes, raisins and other dried fruit are popular. Recipes for fillings and masa vary from region to region, family to family. But, the ritual of spreading corn dough on corn husks – or, sometimes, banana, plaintain or avocado leaves – and stuffing them with anything from shredded pork to pineapple means the same thing for many families: Christmas and family. They also mean a lot of work. “Mom would be cooking and we’d all be in a line, trying to do our part,” said Sergio De Leon, who sold his mother’s tamales with his brother as boys in the plaza of Matamoros in the state of Tamaulipas, Mexico, where he’s from. After his family came to America for farm work when he “was 7 or 8,” he and his five siblings would reheat their mother’s tamales over campfires in the fields. He was 21 when the family stopped moving from state to state, following the crops. The way his mother made tamales, with shredded pork, remains his favorite. De Leon Foods sells tamales stuffed with shredded pork, beef and chicken. (Pork and chicken are $20 per dozen; beef is $22.) Vegetarian tamales are available by request. Masa is mixed in-house using masa harina, or fine corn flour, along with baking soda, salt, warm broth, thick lard and – for red masa – guajillo peppers pureed into a paste with garlic, cumin and black pepper. At home, mixing is done by hand. The ingredients need to be thoroughly blended. And with every press, punch and fold, tamales makers dig deeper not only into the dough but their heritage. That’s something Sergio De Leon likes about the process. He recommends gathering friends and family members along with a few bottles of wine to enjoy while the work gets done and the memories are made. The matriarch or patriarch (or both) generally oversees production, often done assembly line-style, young and old working side by side. The husks have to be rinsed, then soaked in warm water to make them pliable. The masa must be mixed, then spread – a tablespoon or two at a time – on those husks, which then need to be wrapped up – one by one – like little gifts. Dozens and dozens of dozens of little gifts. It’s more fun – and the job finishes much more quickly – if the work is shared. Sharing the work is part of the tradition. It’s the same at the store. Some seven kitchen employees, including his sister-in-law, Linda Lopez, 50, make tamales twice a week starting at 5 a.m. By 9:30, they have about 2,500 tamales, which they steam – about 180 at a time – in a commercial-size pot for two hours. They beef up production from the end of November to the end of the year, when demand increases for the holidays. “I don’t even know where to start on how many dozen we sell at Christmas. It’s a lot,” Sergio De Leon said. The store also sells its prepared masa – for those who want to fill and fold tamales at home without the hassle of mixing the fine corn flour. It’s $2.49 per pound. By comparison, a bag of just over 4 pounds of masa harina is $3.99. Masa traditionally uses lard, something De Leon’s also sells. “It’s what keeps it together,” Sergio De Leon said. By mid-2017, De Leon’s plans to start making its own masa harina from scratch, cooking corn kernels with slaked lime to make nixtamal, then grinding it into fine corn flour. But even if you’re not making and grinding your own nixtamal, tamales are labor-intensive. Everything is done by hand. Lopez spreads masa over the entire husk, turning up the middle then folding over each side before placing them, seam-side down, in the center of the pot. She stacks them as if she’s building a campfire, with the open ends facing upward. Tamales makers will want to watch the pot or at least stay close to it. They need to know when to add more water during the steaming process. Or, try this trick from Roberto Santibanez, author of 2012’s “Tacos, Tortas and Tamales: Flavors from the Griddles, Pots and Streetside Kitchens of Mexico.” He recommends placing a coin in the bottom of the pot so you can tell if the water has evaporated. “You will hear the coin start to jiggle when the water boils and you’ll know you need to add more water when the jiggling noise stops,” he wrote. Even though she makes thousands of tamales per week at the store, Lopez still makes her own at home at Christmas. To her, she said, tamales mean family. 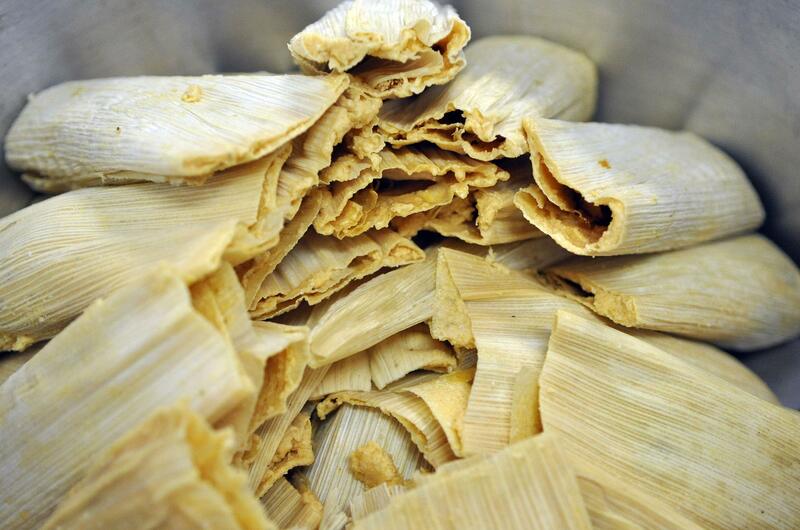 Order tamales from De Leon Foods Grocery and Deli, 102 E. Francis Ave., by calling (509) 483-3033. To reach the Spokane Valley location, 15530 E. Sprague Ave, call (509) 926-5009. On the web: http://www.deleonfoods.net/. Mix the masa harina, baking powder and salt in a bowl. Add the broth or water, and mix thoroughly with your hands to make a soft, moist dough. In another bowl, mix the lard or vegetable shortening until light and fluffy. Add the masa and continue beating until the batter becomes smooth and slightly sticky. Prepare your tamales with the filling of your choice. Cover the pork with water and bring to a boil. Reduce heat and simmer for about 2 hours until the pork is well cooked. Lightly saute the pasilla chili in a vegetable oil. In a blender, mix the chilies and the water. Cut the pork into small pieces and fry in vegetable oil until golden brown. Add salt and chili mixture and cook for 5 to 7 minutes. Soak the corn husks in warm water and drain well. Spread the prepared masa evenly over each corn husk, and add a tablespoon of the pork mixture in the center. Close the husk, folding all sides inward toward the center. Place tamales in the steamer. Cover with a wet cloth and steam for about 1 hour. Published: Dec. 20, 2016, 11 a.m.